Come on in we're glad you stopped by. For you know what today is... Deck the Halls Tuesday. Graciously hosted by Susan from ThoughtsFromOvertheRainbow. I know we're in for a treat, so let's get going. 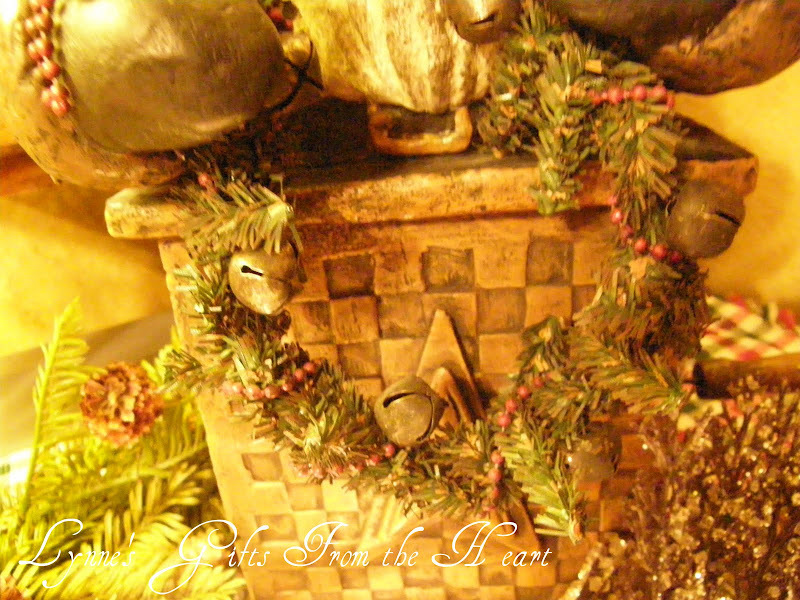 Normally, this time of year you'll find a rooster plate in this iron plate holder. With an assortment of snowmen plates to choose from I chose this snowman plate. The teapot lamp was a gift from my daughter a few years ago for Christmas. It's taken it's place of honor on the kitchen counter since that day. A few old books is the perfect riser for these snow people. Playing music for the animals in the forest. What a heavenly sound. Puts off quite the glistening glow. 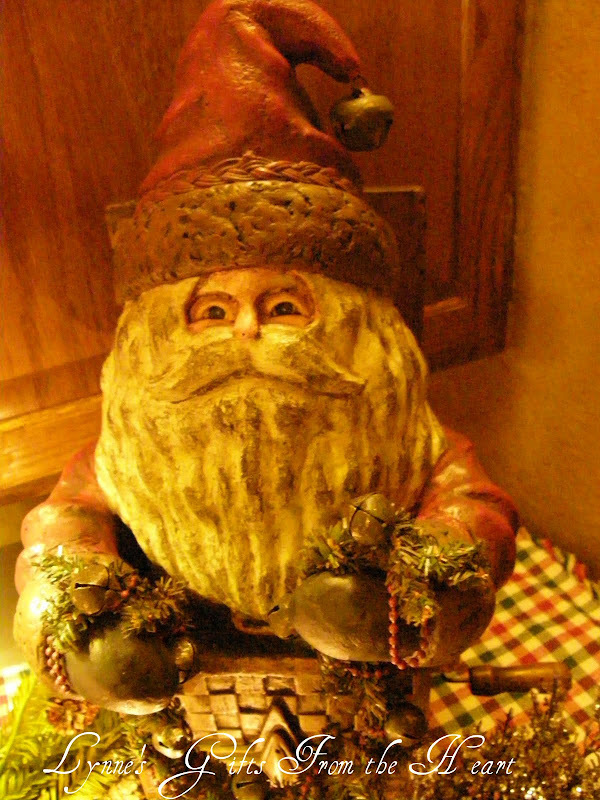 Santa Ho welcomes you as you come through the door. 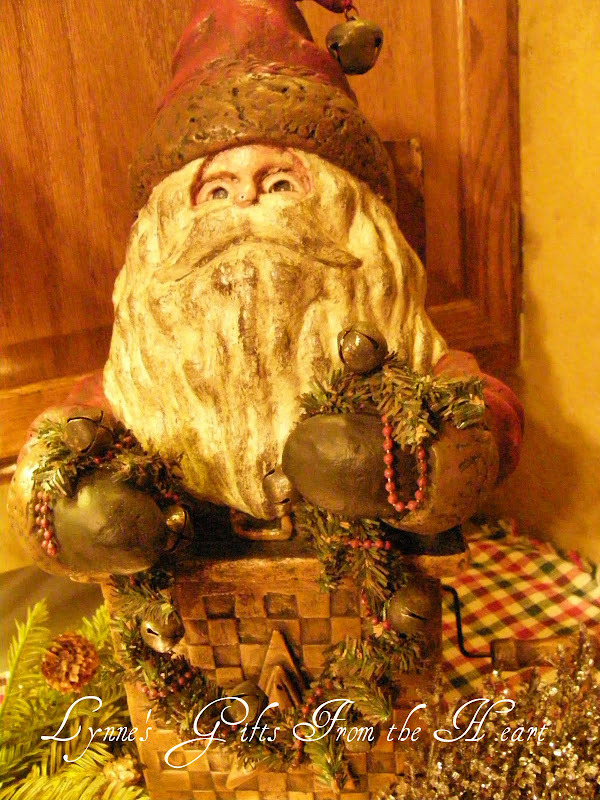 Since this is a magical time of the year, I wonder if I turn his crank you'll hear some beautiful Christmas music? The basket weave on his box is so incredible. He has his bells ready to alert the reindeer for take off time. At night all a glow.. Thank you so much for stopping by today. We sure enjoyed having you. Susan, thank you for hosting a great party filled full of beauty. I've had a ball as I'm sure the others have as well. 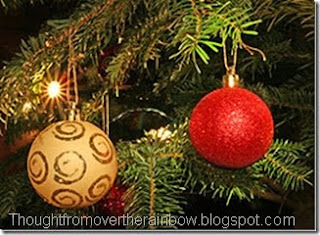 Your decorations are just gorgeous! So pretty! I love that you decorate your laundry room. Love the snowmen too! oh i love the laundry room!! I woulld never think to decorate in there but it looks great!! 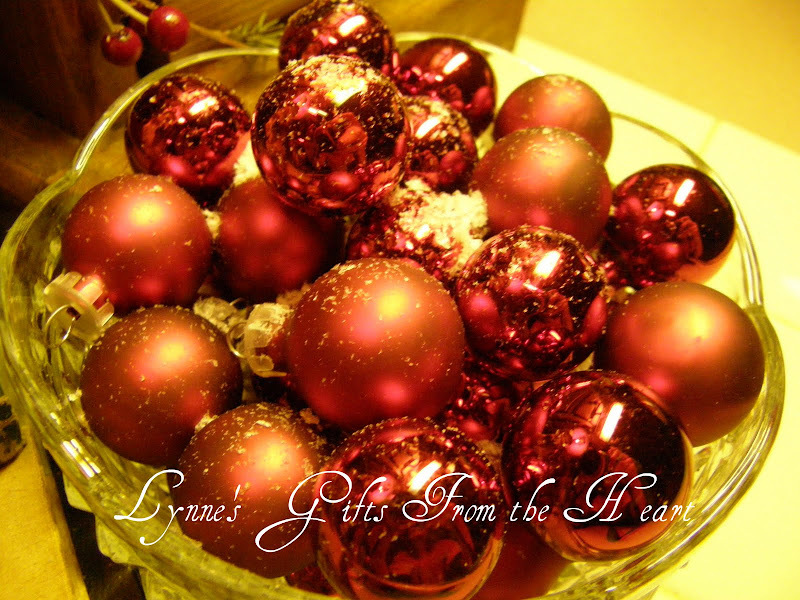 Lynne, this is all so beautiful!! And your washer and dryer even! Gorgeous!!! Everything looks wonderful!! 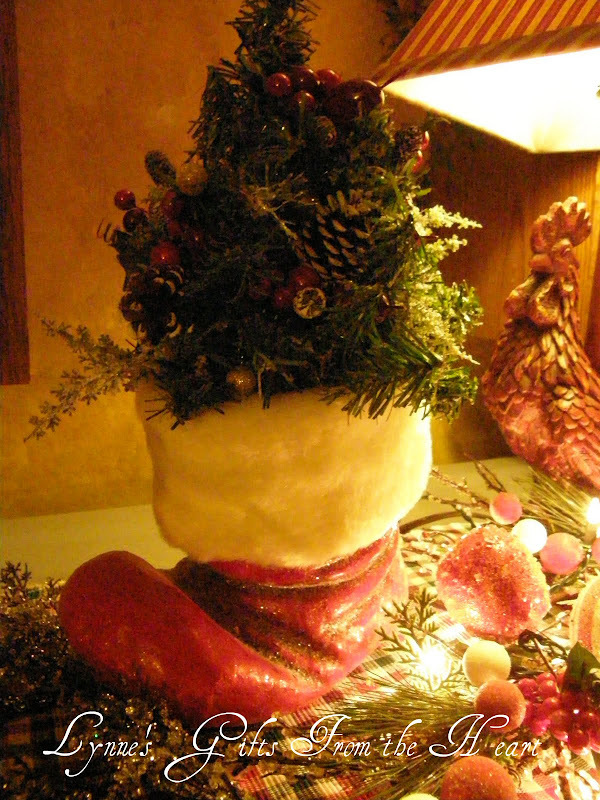 I have a rooster lamp too...love how you have decorated around yours. 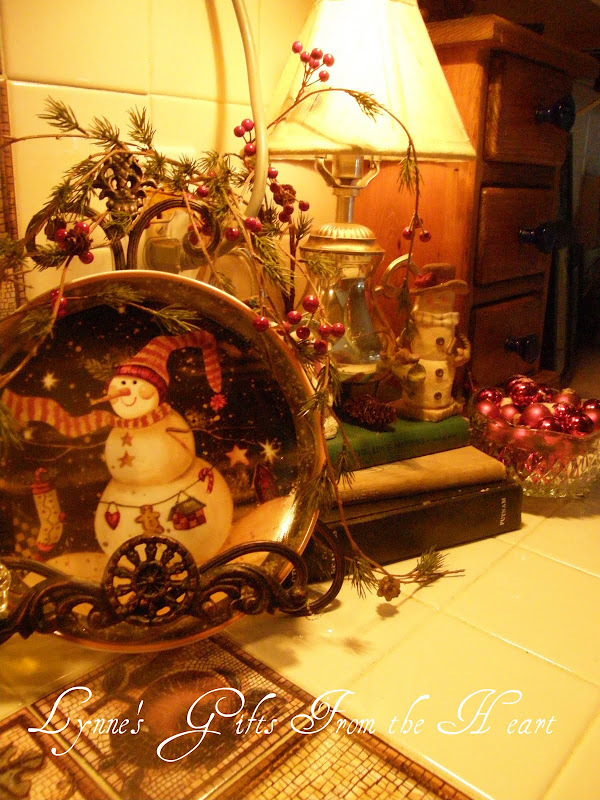 I just love snowmen and your snowman plate is so adorable!! 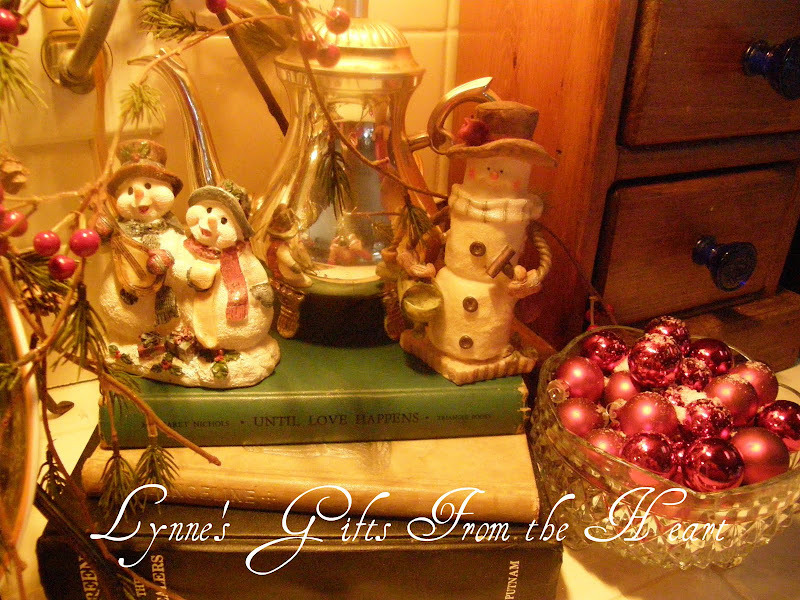 Oh Lynne, your decorations are so pretty. I love the laundry room decorated!! 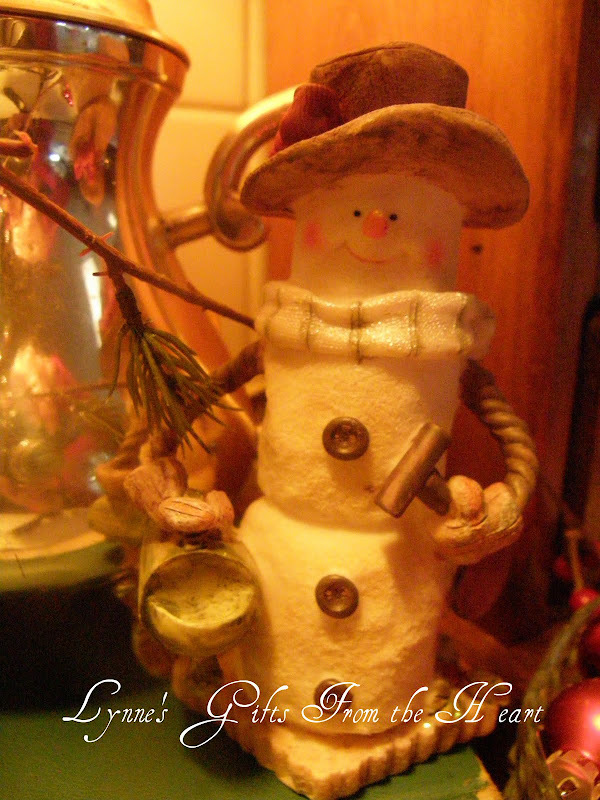 Usually I am feeling chilly when I see snowmen but at your home, it's all warm and cozy! 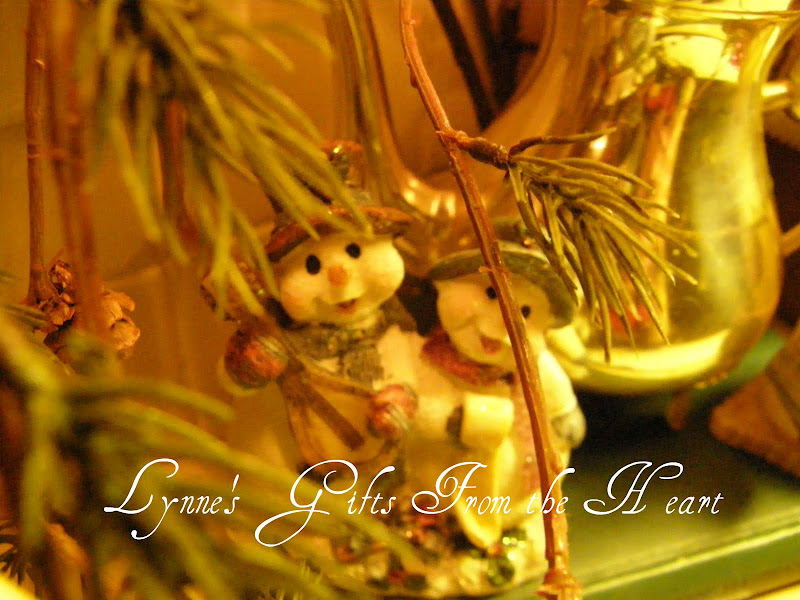 lynne, i'm so hugging that marshmallow snowman (and secretly wanting roasted marshmallows over the fire in the fireplace) LOL. 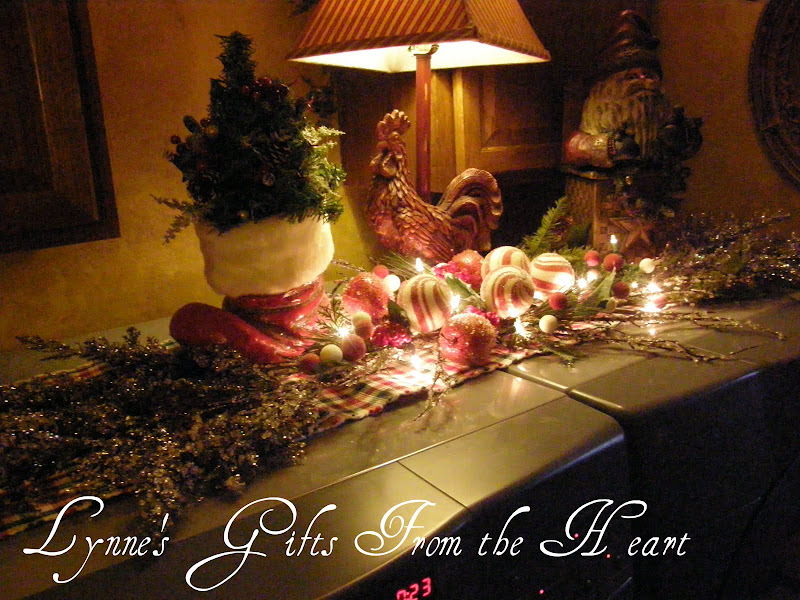 I guess we all like your washer and dryer, You do have lot's of holiday cheer. What fun to look around your home. 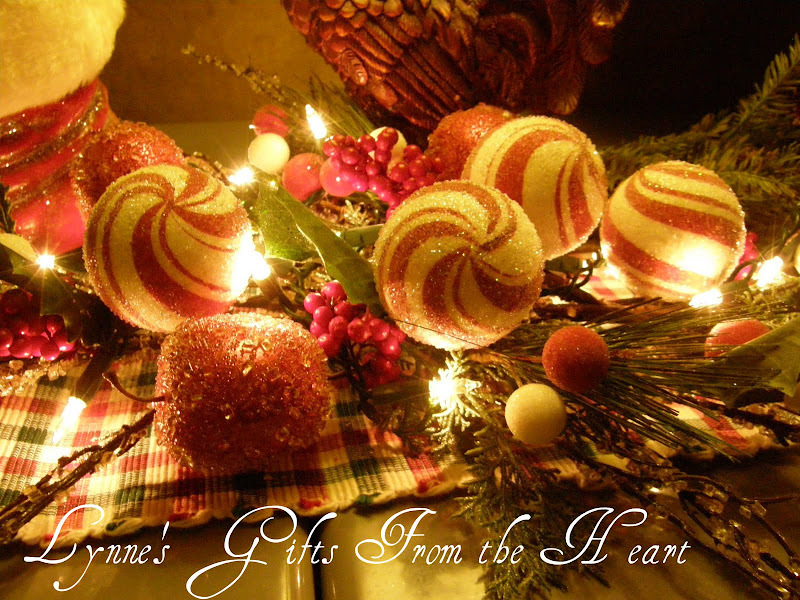 I love your decore - really love those big peppermint balls ! The glow is so nicely and I am afraid your snowmen may melt....LOL ! I joined the party too! Aren't these fun. I have followed your blog for quite a while and always enjoy your posts. Now THAT is my kind of laundry! I love it. Each vignette is prettier than the next. Thanks for sharing. 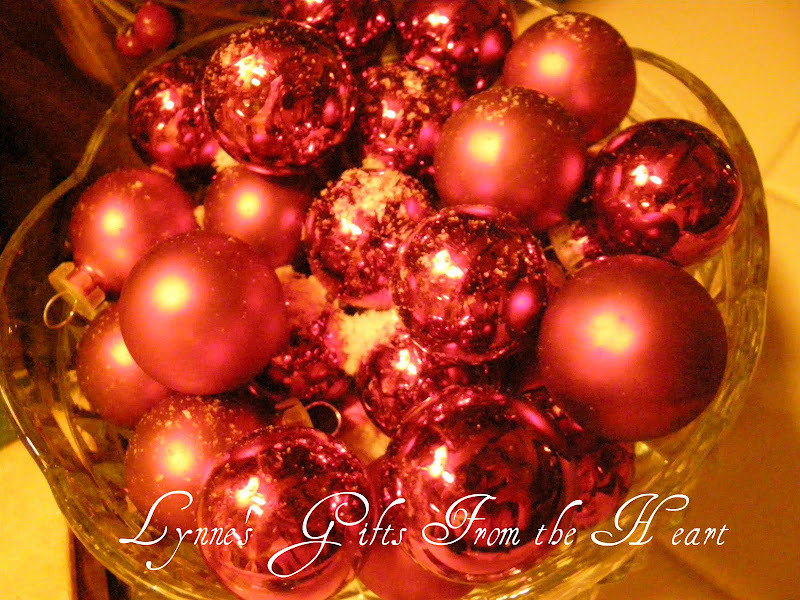 Lynne-You have the gift!!! Each picture is a masterpiece filled with wonderful details! I can't even see the top of my washer and dryer.. :)That rock candy looks like jewelery! 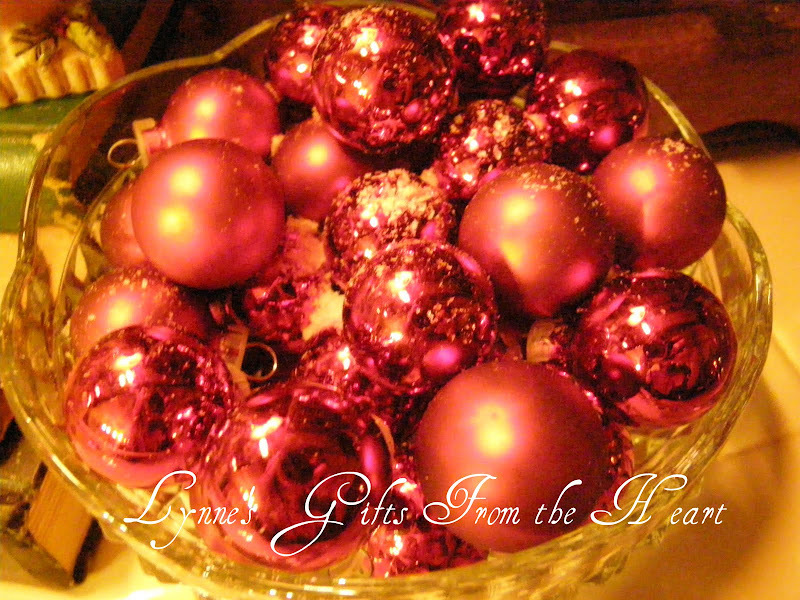 Thank you so much for sharing this and linking to "Deck the Halls"!! Ohhh...I love snowmen!!! You have some adorable little snow guys and gals! Love the photos of them playing "peek-a-boo"! Hehe! Too cute! 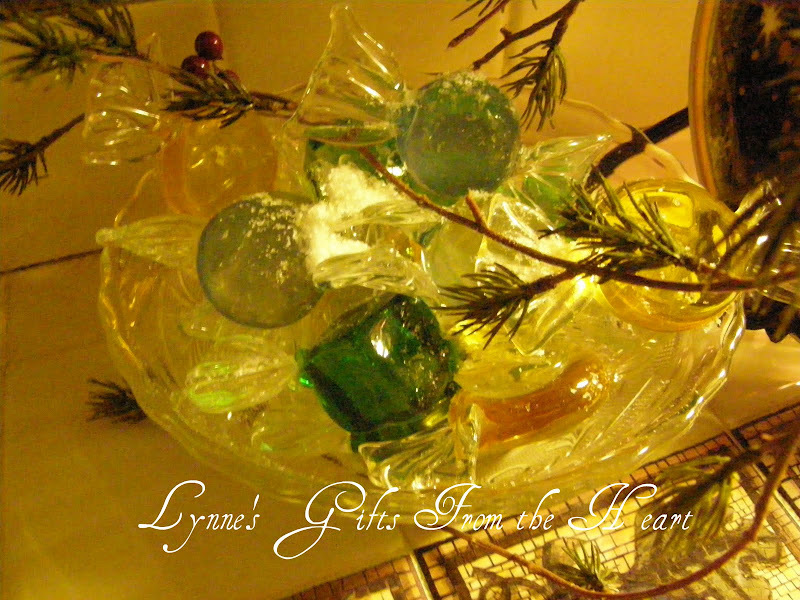 Lynne, you are so creative! Now, I just adore your new snowman plate...sooo pretty! You have decorated that nook in your kitchen sooo beautifully! By the way, I love, love, LOVE the teapot lamp!!! What a sweet gift from your daughter! Okay Girlfriend, I have to hang my head in shame! I'm sitting right here beside my washing machine and dryer and the only thing decorating them is a big ol' basket of laundry! hehe! Girl, you are too cute and I love your beautiful laundry vignette! Ohhh...that Santa on the box is sooo adorable!!! Well my friend, you have done it again! I always love visiting your beautiful home and all of your pretties!!! What a sweet treat!!! You've gotten so good with the pictures! Beautiful decor. I LOVE your decor, Lynne. It's gorgeous! I love all the details you put into your decorations. I'm glad you shared them with us. Merry Christmas! 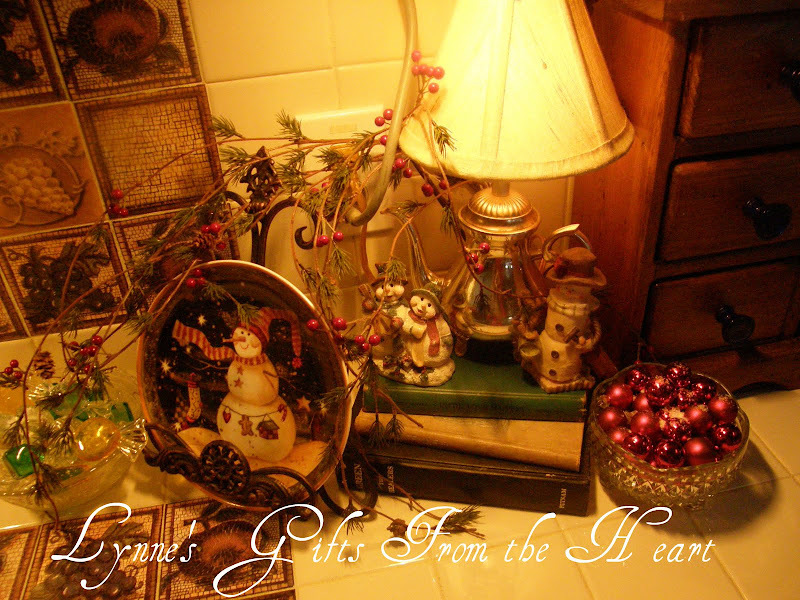 Love every detail of your decor....even the laundry room, LOL...a true Christmas decorating phenom. You did a wonderful job:) Everything looks gorgeous!! This is all just so beautiful. I love how you had cutlines for every picture. And all those pictures are gorgeous. 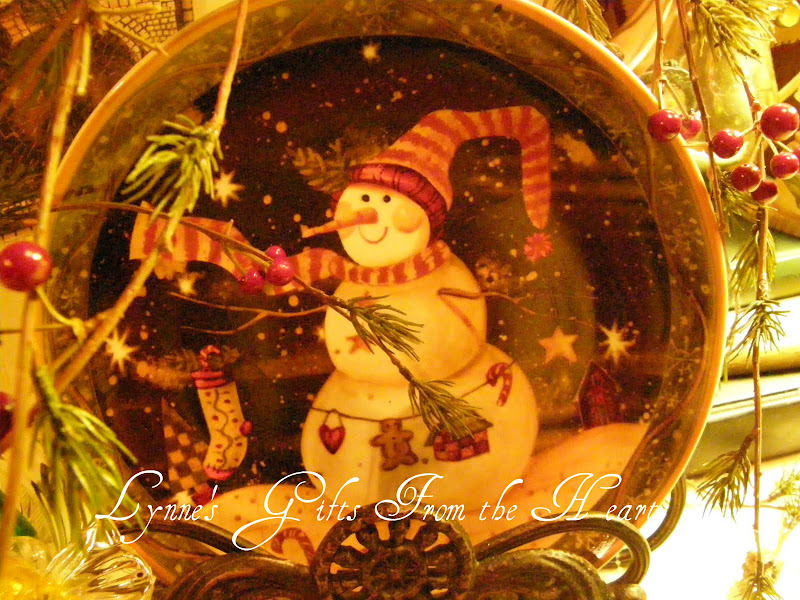 Love the vivid colors, the Santa, the snowmen..... I could go on and on. 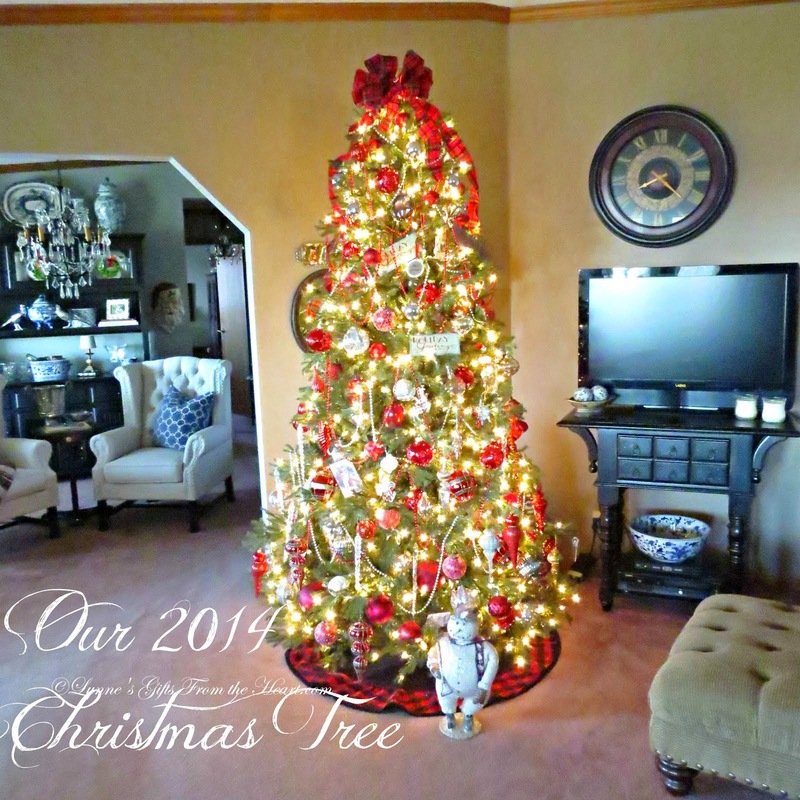 Thanks for giving us a glimpse of your decorating. girl!!!! this is just the most beautiful!!!! you have such a good eye for great things to sue!!! I love snowmen and you did a wonderful job! 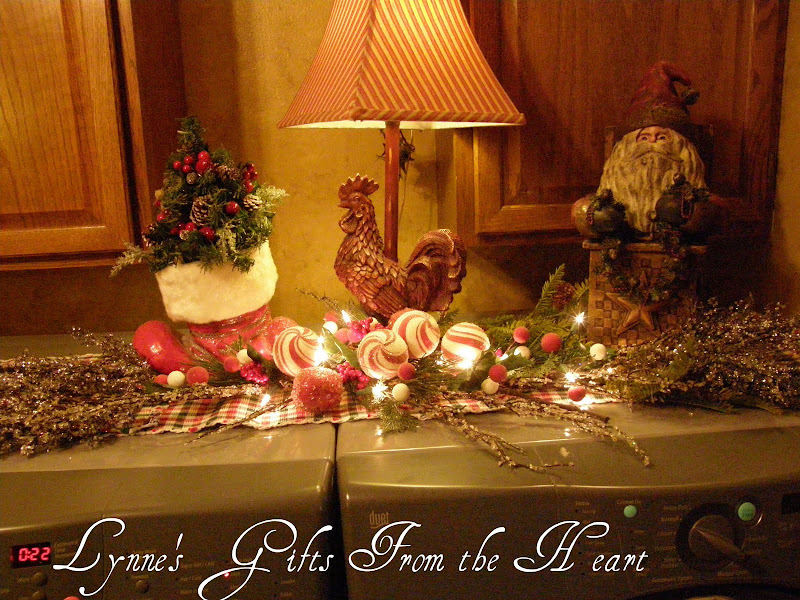 Your decorations are absolutely dazzling, Lynne. 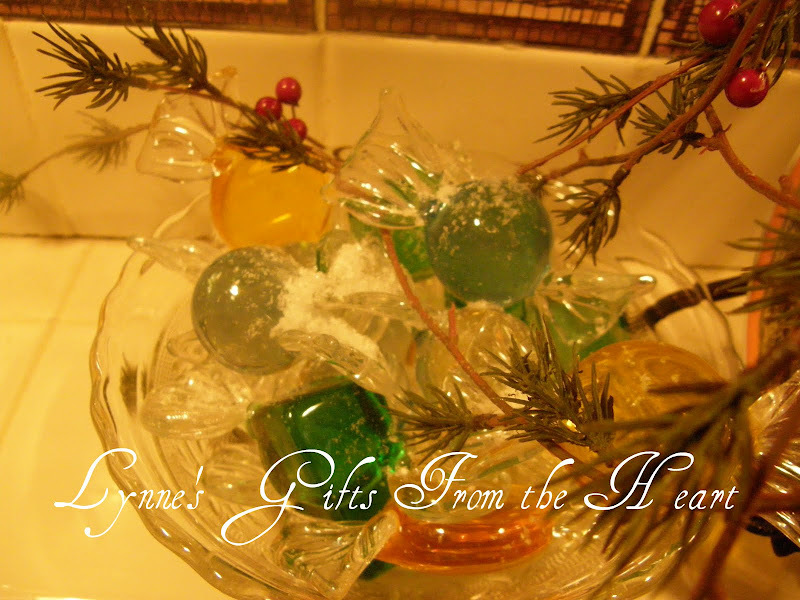 Those precious little snowmen peeping from the vines...the rock candy...the ornaments. It just makes me feel wonderful to visit. 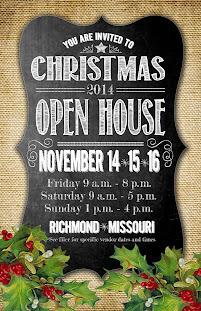 I'll look forward to seeing you Friday! 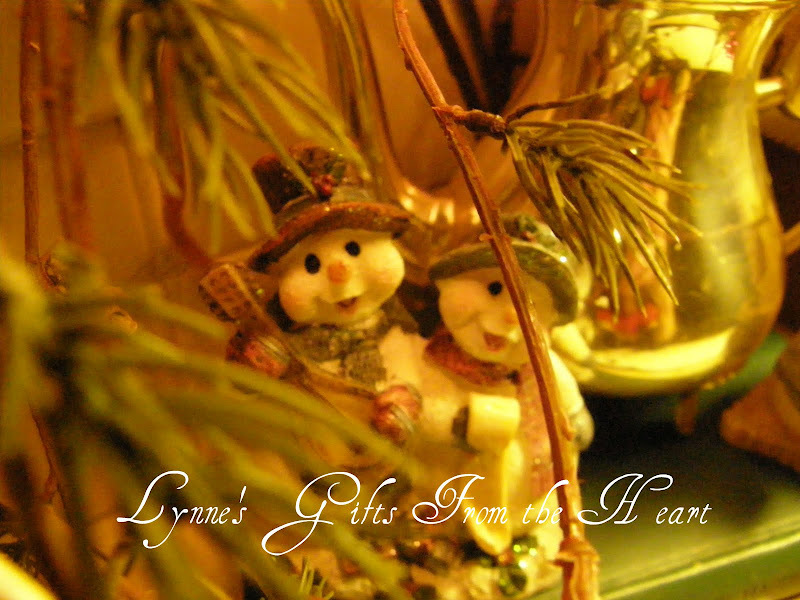 Lynne, it all looks so festive. 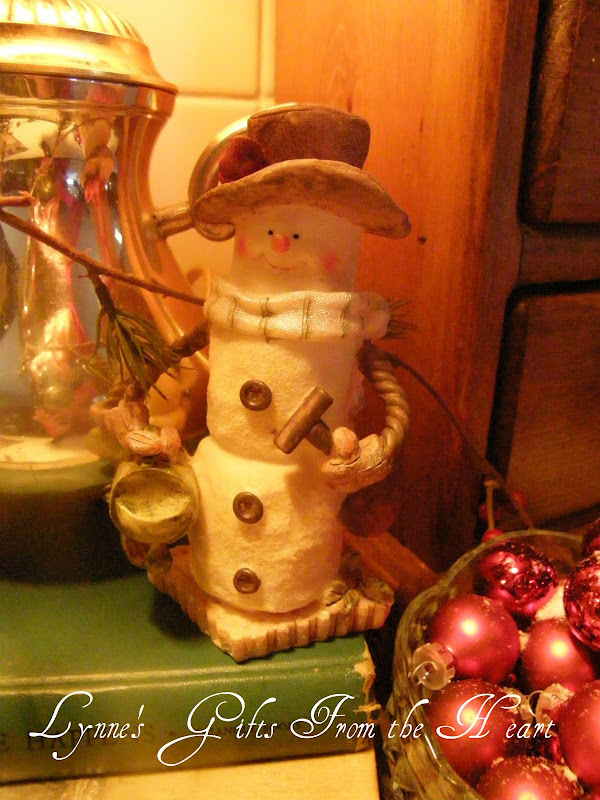 Love the little snowmen and the vignette you've created. 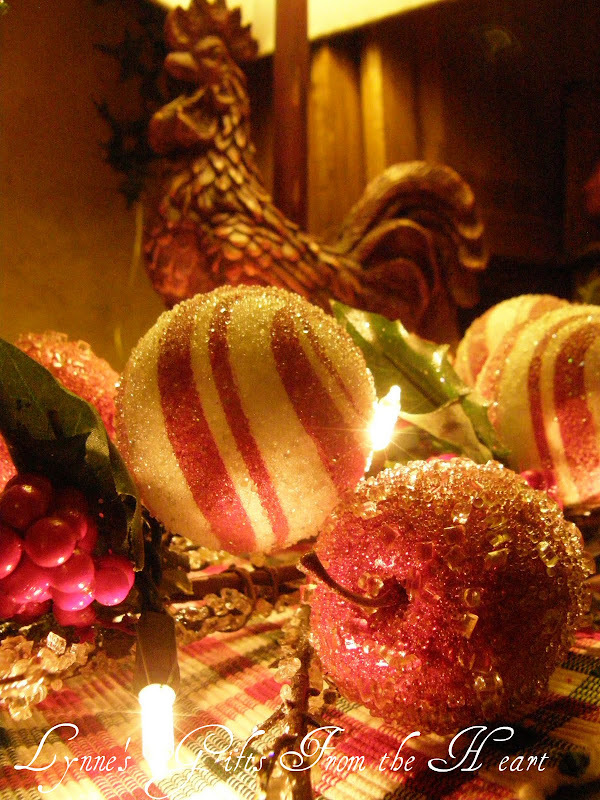 Your home glows with the joy of the season. Your snowmen vignette is so cute! Love it! Also...I would have no problem doing my laundry in a room like yours! Love that too! Hugs! Oh, Dear Lynne! Your little snowmen are so precious. I just love how you've decorated your kitchen. Now I'm all over your beautiful laundry room. 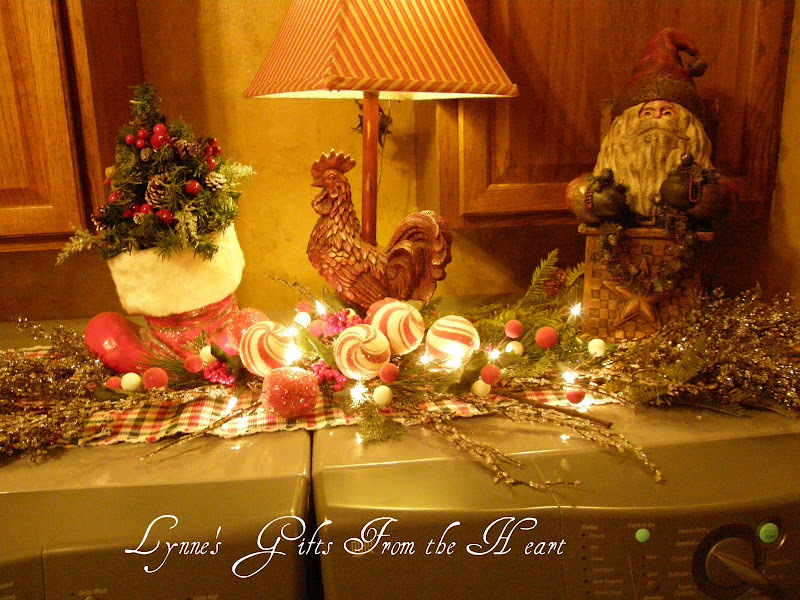 I love how your just ignored the machines and made the tops look gorgeous with your rooster lamp and Santa! Oh, you're jut too good! Wow, Lynne! I'm so impressed with all of your decorations! You go all out! I love the bowl of rock candy! Everything looks beautiful! I adore your decor. All of your snowmen are just too adorable. And I love that you decorated the top of your washer & dryer.